Malignant transformations which lead to cancer can already be detected on a cellular level. For instance, the most common property of solid tumors is abnormal DNA content. DNA Image Cytometry is a technique for measuring the DNA content from digital images of cells. These images are acquired using a microscope and a digital camera. Measurement of DNA is enabled by a special preparation technique and dedicated image processing algorithms. 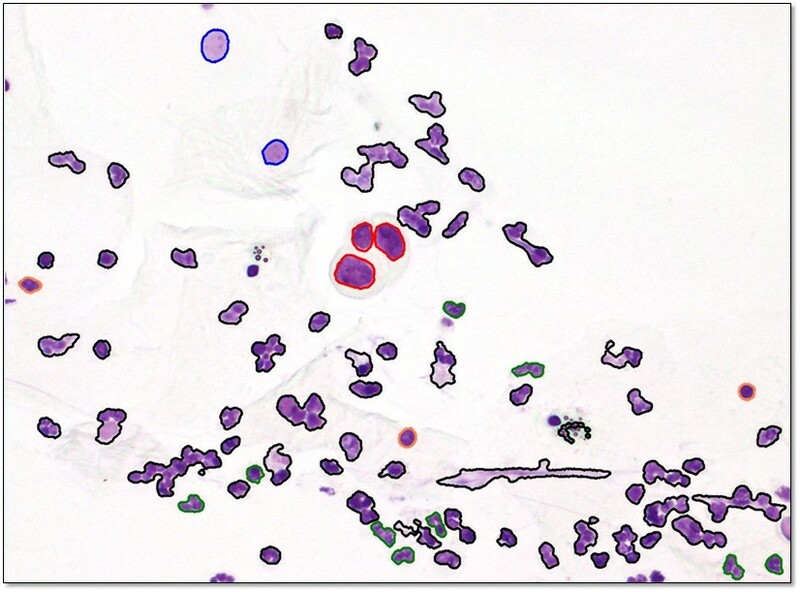 For a DNA Image Cytometry measurement, the pathologist identifies morphologically suspicious nuclei among ten thousands of objects and requests the measurement of their DNA content. Finally, the pathologist analyses the DNA distribution of the suspicious nuclei. If this distribution deviates from the distribution of normal cells, the patient has cancer. Additionally, the more this distribution deviates from the distribution of normal cells, the more aggressive is the cancer. So besides the diagnosis, this knowledge can be used to choose the most effective and least invasive treatment. The patients benefit from DNA Image Cytometry in several ways: as the cancer is diagnosed on a cellular level, cancer can be diagnosed up to 2 ½ years earlier. Extracting cells for measurement, for instance by a brush smear or fine needle biopsy, is minimally invasive and almost pain free. The fact that diagnosis and prognosis rely on a measurement result yields a high reproducibility and trustworthiness of the results. By only considering suspicious nuclei, the method is highly sensitive. Achieving a high precision in measuring DNA, so that malignant transformations are detected as early as possible. Supporting the pathologist in the labor intensive measurement, by digitalizing and classifying objects automatically. In order to achieve these aims we work in close cooperation with our medical partners Prof. A. Böcking (Institute for Pathology, Hospital of Düren) and Prof. S. Biesterfeld (Division Cytopathology, Heinrich-Heine-University Düsseldorf). For a precise measurement of DNA, sources of errors in the microscopic image formation like glare and diffraction are corrected. The algorithms for DNA measurement developed at the Institute of Imaging and Computer Vision clearly outperform conventional algorithms: With the developed algorithms it is possible to assess one missing or spare chromosome, one of 46 parts of the human DNA. 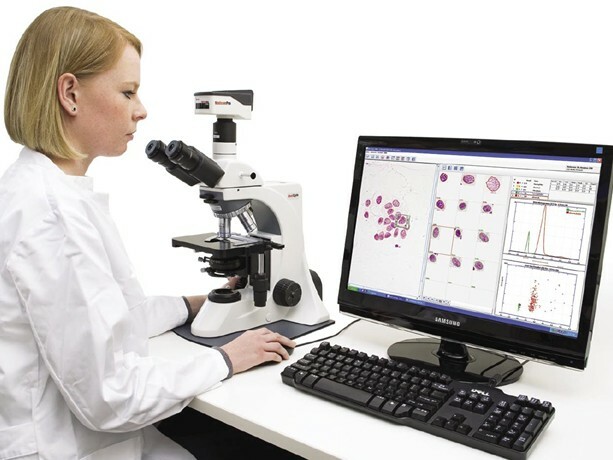 In order to perform DNA measurements more effectively, a motorized microscope performs an overview scan of the slide. From this scan, the regions of interest (ROIs) are identified. The nuclei from these ROIs are automatically digitalized. A pattern recognition system classifies these nuclei into clinically relevant nucleus classes. 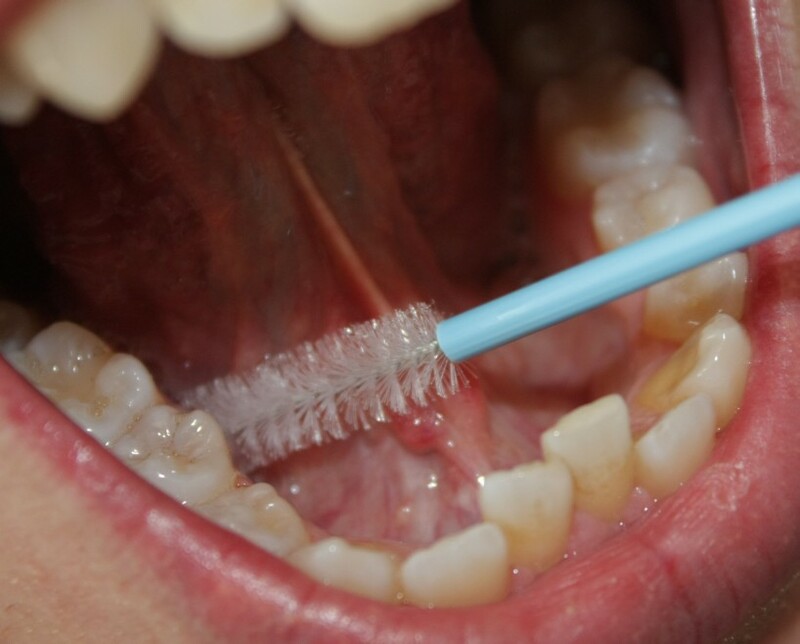 Such pattern recognition systems have been developed for smears of the oral and cervical mucosa, as well as fine needle aspirates of the prostate and effusions. The reference database needed for classification contains more than 130.000 objects, which all have been classified by Prof. A. Böcking. The pattern recognition systems are able to distinguish suspicious from benign nuclei. After the cells have been classified, the pathologist verifies the relevant nuclei and performs the diagnosis. Instead of 40 minutes, which are needed for a manual DNA Image Cytometry measurement, this requires just five minutes. So the responsibility for the result fully remains in the hands of the pathologist, while the time needed is reduced significantly.